Muhammad Kam Bakhash was the youngest son of Emperor Aurangzeb. He reigned as the emperor for a very short period of just two years (1707-1709)! The period immediately following Aurangzeb’s death witnessed a struggle for succession among the king’s sons - Muazzam, Azam and Kam Bakhsh- giving birth to the complexities of clashing ambitions, group rivalries, diminishing centralised power and the decline of moral and ethical values, which lasted until the end of the Mughal Empire. In 1707, a war of succession began amongst his three surviving sons, Muazzam – the governor of Kabul, Azam-the governor of Gujarat, and Kam Baksh-the governor of Deccan. Azam turned to Ahmednagar and proclaimed himself as emperor. Kam Baksh too declared himself the sovereign ruler and conquered important places as Gulbarga and Hyderabad. Kam Bakhsh had assumed the throne at Bijapur and struck coins in his own name, and declared himself Padshah Kam Bakhsh-i-Dinpanah (Emperor Kam Bakhsh, Protector of Faith). Due to his short reign, coins minted in his name are extremely rare. 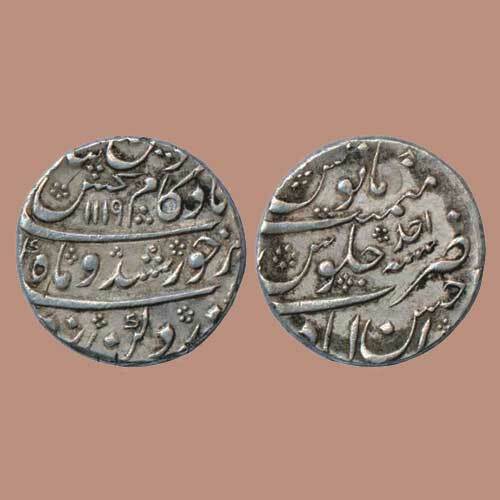 The above shown is a silver rupee of Muhammad KamBakhsh. The obverse of this coin is inscribed with the legend 'Sikka Zad Dar Dakkan Bar Khursheed o Mah Shahe Kam Bakhsh Din-e-Panah’ with AH 1119 and the reverse of the coin is inscribed with ‘Zarb Ahsanabad Sanah Ahad Julus Mainamat Manus’. This extremely rare silver rupee coin was sold for INR 2, 60,000 by Classical Numismatic Gallery.